The Pilgrimage for the Sea Services will be held at the Seton Shrine in Emmitsburg on Sunday, October 7. The U.S. Navy, Marine Corps, Coast Guard, Merchant Marine and Public Health Service are all involved in the annual event. The Joint Ceremonial Honor Guard join the procession at the beginning of the Seton Shrine's annual Pilgrimage for the Sea Services. This year, the Pilgrimage is on Sunday, October 7, at 3pm. All are welcome to the Annual Pilgrimage for the Sea Services at the Seton Shrine on Sunday, October 7, in Emmitsburg, Maryland. 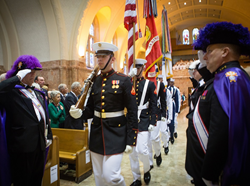 Saint Elizabeth Ann Seton is the Patroness of the Sea Services, which includes the U.S. Navy, Marine Corps, Coast Guard, Merchant Marine and Public Health Service. The late Cardinal John J. Connor, when serving as the Navy Chief of Chaplains, advocated for her designation as the Patroness of the Sea Services in 1977. The 3:00PM Mass will be celebrated by Father Francis P. Foley, CAPT, CHC, USN and Command Chaplain of the Unites States Naval Academy. The Pilgrimage Mass, at 3:00PM on October 7, takes place in the Basilica at the Seton Shrine, located at 339 South Seton Avenue, Emmitsburg, MD. A complimentary dinner will be provided afterward to all in attendance. If you would like to attend, please contact Rob Judge by calling 301-447-6037 or through email at Rob.Judge(at)setonshrine(dot)org.